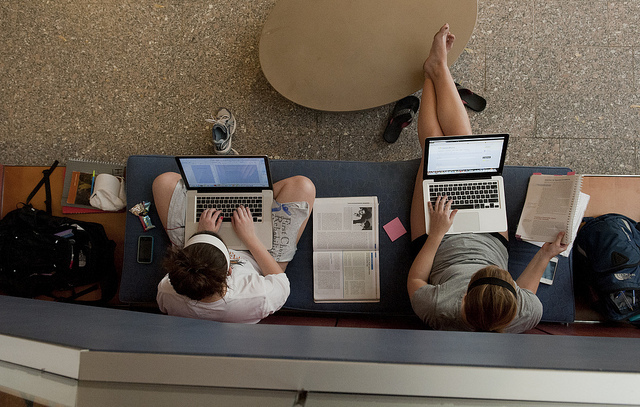 Photo: “Finals Week Sping 2012-005” by Penn State. Flickr Creative Commons. 1. Prioritize to help make decisions about how much time to allot to prep for each exam. Which exams will be hardest? What portion of my grade is each exam worth? How much time should I spend on each exam based on how I answered those questions? 2. Find out what you know. Use your syllabi to make a list of key concepts you need to know for the test. Hide all notes and books and test your understanding on each key concept. Ask yourself how well you can summarize main ideas, do sample problems, recall facts from memory, and apply concepts in a new way. 3. Make a smart study plan. Make a study guide, merging main ideas from class notes and readings. Make mind maps, time-lines, or flashcards. Teach concepts to someone else. Write or speak aloud the main ideas. Generate higher-level thinking questions to test yourself with. 4. Make a smart study plan (part deux). Once you’ve selected study tasks for the concepts you rated 1 and 2, estimate how much time you will need to complete them. Look over your calendar and lay out a plan, noting exactly what you will be doing and for how long. Break down studying into specific, discrete tasks. “Study Chem” is too vague. “Complete practice problems from chapter 3” is specific. Estimate how long each task might take and compare it to available time. Create an “appointment” to complete practice problems. When you’ve completed your Study Plan, it’s time to test yourself again. Hide all your materials and test your understanding on concepts you rated 1 and 2 the same way you did in Step 1. Can you do a problem from memory? Can you restate or rewrite what you learned? Can you teach these concepts to a friend? Still stuck on a particular concept? Keep practicing! 6. Come to the Learning Center! In addition to the strategies above, you can come to the Learning Center for our Study Boot Camps. Find out more about our Boot Camps and other services such as Academic Coaching and Peer Tutoring at http://learningcenter.unc.edu/. This blog article was written by Bob Pleasants, Assistant Director of the UNC Learning Center. It has been edited for clarity and reposted.